449 pp. At the time of this review, 3/3/2017, it holds a 3.5-star review on Amazon. The tale is told and retold, twisted and tweaked, snipped and stretched as it leads to happily ever after. No one has ever broken free of the Godmother’s terrible stone prison until a girl named Pin attempts a breathless, daring escape. Buut she discovers that what seems like freedom is a prison of another kind, one that entangles her in a story that leads to a prince, a kisss, and a clock striking midnight. To unravel herself from this new life, Pin must choose between a prince and another—the one who helped her before and who would give his life for her. Torn, the only thing for her to do is trade in the glass slipper for a sword and find her own destiny. Ash & Bramble launches a fairytale retelling unlike any I’ve enjoyed before. Story drives this world, whether the “characters” in the story know it or not. Imagine being plucked from your village, your life, your family, and set into a Story. So that the Story may play out as it has countless times before it, the Godmother makes you forget your Before. It is Nothing. Maybe you’re permitted to remember a shred of something from your old life because you have the potential to be a Storybreaker; or you have enough survival instincts to feel in your bones that something is off. People disappear, but those around you seem not to notice. Or you have a headache when you try to remember the day before this one, but you think harder, and instinct screams an unnatural force has played with your life. Godmother places you into a role, such as Shoemaker or Seamstress or Jack (Jack of all trades, the makers of a stack of mattresses for the Princess and the Pea test) or any number of the background characters I never considered in the fairytales of old. In this telling, their roles scream of unfairness, brutality, horror. If the Godmother appears with a gorgeous dress, full of opals and other jewels, and stitches “must be no bigger than a grain of sand.” Blood and pain make these dresses gorgeous, the labor of Seamstresses of all ages, hunched more and more over their precious silks as they stitch these magical gowns without sufficient light. Prineas paints the soldiers, the taskmasters, the guards, all with animal features sufficient to figure out which poor animal got jerked out if its life to serve Story. They play their parts with no hint of remorse. One bit of the storytelling took me a few chapters to get into: Pin’s story is her voice, first person present, and made wavering because she does not know her Before. But she somehow knows, she must keep her thimble safe, hidden, even when she’s punished for the audacity to try to remember, to show kindness to other Seamstresses—it is her one possession from Before. When the story flips to Shoe’s point of view, the potential love interest, Prineas writes in third-person present. It has just as strong a voice as Pin’s, but before I can settle into his rhythm, we’re back to Pin’s POV. Although this book is named a romance, don’t expect a book filled with love and romance and kisses and sighs. Story drives this book, and story wants only the artificial Happily Ever After without giving a fig what the people wanted before Godmother pulled them into Story. I don’t ever want to cross the Godmother. More than romance, this book sizzles as a tale of survival, of finding yourself when you’re lost, and of friendship—the bonds that strengthen through adversity, finding others Pin and Shoe cherish more than themselves. I enjoyed the questing nature Prineas made of the pursuit of love, because she made both characters work at figuring out what they wanted. However, In reviews I skimmed, it seemed Prineas’s treatment of the romance resulted in some of the lower stars, so I’m sharing my view. Prineas pulled me in with her sensory details and even the hum-drum of the day, with characters stuck in their drudgery, or scheming to get out of it. The author did hit my pet peeve, the filtering language of “see,” “smell,” “taste,” and so on, instead of the stronger details—for example, I don’t need Pin to say she “can hear the clock chime.” I want my body to vibrate from its thunder. Those are the moments that bumped me out of the tale that had me curled up, enjoying however much of the chapter I had time to read. I delighted in her pacing, speeding and slowing, deepening the risk, showing me what Godmother could do with her magic, what happened to those who dared to break out of Story—because I know the story, the details from various tellings, and I’d wonder what roadblock Prineas would add, and how Pin or Shoe would puzzle through it. When the story line moves on to the wicked stepmother, the wicked step-sisters, Prineas gives me the details to make me hate the steps here, gulp and pity them there—for they are under Story’s spell as surely as Pin and Shoe. And Story has ground centuries of its players into dust. But them that knows resist, and provide aid to Pin and Shoe. Even the poor Prince had a Before—but was he ordinary, or a prince, in that Before? Does he love Pin for herself, or because Story compels him to? 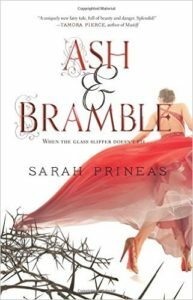 If you’ve read your share of fairytale retellings, and enjoy a different spin, then grab Ash & Bramble. I never wanted to put it down; and now that I have, I’m itching to get my hands on the sequel, Rose & Thorn. Learn more about the next volume of Story, Rose & Thorn, at the author’s webpage, her Amazon page, or buy Ash & Bramble, as it contains a chapter of Rose & Thorn. Find other reviews of Ash & Bramble at Amazon or your favorite book-review site. Find the author also on Facebook and Twitter. Have you read Ash & Bramble? What elements of it did you enjoy, or what bugged you? Did you hunger for the characters to break out, or did you think they should stay in the world Story gave them? Did you imagine yourself in Pin’s or Shoe’s shoes? I’m always looking for YA fantasy authors. If you’ve got a new book or an old favorite you’d recommend, add it to the comments. I thank you, and I’m sure my followers will thank you! My book reviews also live on Amazon and Goodreads. If you found the review helpful, I’d appreciate a “like” or “it was helpful” tick-mark in whatever medium you visit. This entry was posted in Book Reviews, Writers and tagged amreading, Ash & Bramble, Book Blogger, Book Review, Fairytale, Fairytales, Fantasy, Romance, Sarah Prineas. Bookmark the permalink.